BORON ULTRA 12 POWDER IN WATER - kill woodworm without odour or solvent vapour - 01626 331351 - free help from our woodworm experts who have over 30 years experience each of woodworm treatment methods and chemicals. Our woodworm treatments are safe and solvent free, pleasant to use and leave no stains or colour. They have no smell, so no odours are left behind in your property (unlike many other types of woodworm treatment). 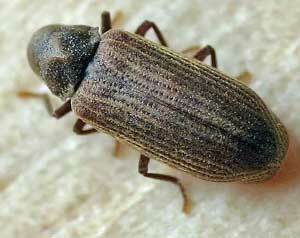 The Adult common woodworm - difficult to spot, it only lives briefly to breed. All the damage is done by the 'grub' or 'wood worm', living deep inside the wood.